Common Good City Farm's programs provide hands-on training in food production, healthy eating and environmental sustainability. Our presence in a multi-cultural, multi-racial, multi-generational community creates an opportunity for people from all walks of life to spend time learning about healthy food and participating in the growing process. The diversity of Common Good City Farm's programs promote a sustainable, local food system that bridges race, class, and age to ensure food security for all people in our nation's capital. We are growing over 5,000 pounds a food each year to share with our community. Through our CSA (Community Supported Agriculture) Program, we distribute weekly bags of produce to participating members throughout the growing season. Typically, members must sign up before the season begins. We offer both full-price and income-qualifying CSA shares. Common Good City Farm's Market CSA is a dependable source of fresh produce without the commitment of a traditional Community Supported Agriculture (CSA) program. Buy credit for CGCF produce at Arcadia and Common Good City Farm's Market at LeDroit Park to redeem throughout the season. Shop Common Good and Arcadia's seasonal offerings right next to the farm on Wednesdays from May 22 - September 25 (3pm-7pm) and 4 - 6 pm in October. SNAP, WIC, Seniors Farmers Market Nutrition Program checks, Bonus Bucks, and Produce Plus accepted. Small Enterprise Program to help sustain Common Good City Farm's programs. More than a farm, we are an outdoor learning center providing education to all ages. 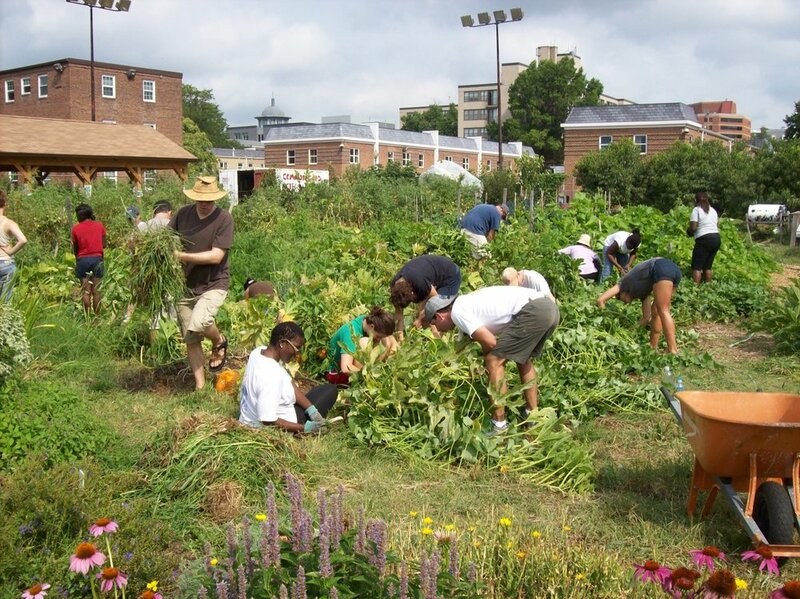 Youth Education programs at Common Good City Farm include a twice weekly farm to table program for neighborhood youth, weekly toddler classes, field trips for DC area schools and a summer Youth Employment Program for high school students. This 8-month herbal medicine program is a hands-on introduction to herbalism. Meeting once per month, participants will tend a garden together, explore the basic concepts of herbalism, and make lots of herbal preparations to bring home and to share with the Common Good community. Throughout the year, we offer Seed to Table Workshops about various aspects of gardening, nutrition, and cooking. Most workshops are held on the farm. All workshops are open to the public, with scholarships available for income-qualifying residents. Our half-acre urban farm demonstrates sustainable urban farming techniques. Not just veggies, our site includes a fruit orchard, beehives, and a community compost cooperative. The City Farmers volunteer program is for individuals interested in a making a regular commitment to the farm. City Farmers are involved with all aspects of running an urban farm, from hands-on farm work, youth education, running our farm market, produce preservation, events and more. Visit our What We Grow page to learn more about Common Good City Farm's vegetable production. ﻿We offer open volunteer days and group volunteer opportunities each season for those who want to get their hands dirty on the farm. Community members are invited to join our compost cooperative. After a 1 hour training you can become a member and are able to drop off compostable materials on your own schedule.